Golden Temple is in Amritsar and a versatile Sikh Religious institution. 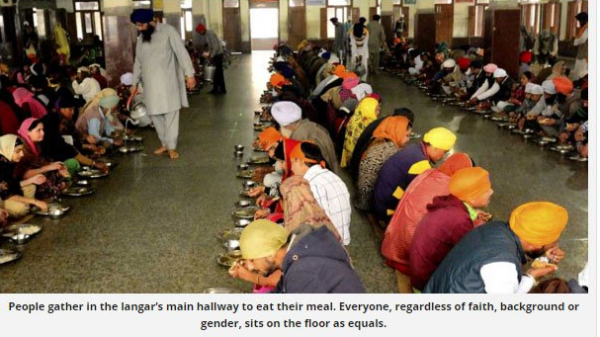 It has an Indian kitchen (Guru Ka Langar) that feeds freely 100,000 people of all faiths daily, round the clock, has commenced another service. Guru Ka Langar Hall at the center of its charitable activities – has announced to distribute only Organic food pretty early. All kudos to SGPC (Shiromani Gurdwara Prabhandak Committee). The committee is to adopt to new ways to go in the required direction. It will have far-reaching changes in the world. The ruling is sure to benefit pilgrims and the tourists alike to the Golden Temple. Natural or organic farming is the practice of planting crops without the use of synthetic pesticides, herbicides, and chemical fertilisers. Alternatively, it highlights on crop rotation, organic composts, and plant-based pesticides and herbicides to sustain soil fertility. This bold decision is timely and beneficial to one and all. “Organic farming is the new mission of SGPC to encourage farmers to change over from the use of the artificially medicated products to the natural pesticides thereby switching over to sustainable agricultural practices,” an SGPC official announced. Cereals, fruits, and vegetables like carrot, radish, cauliflower, spinach and fenugreek (popularly known as ‘methi’) get cultivated at farms in Patiala and Gurdwara Gurusar Satlani Sahib near Amritsar. The spokesperson disclosed that they had now started receiving a quantity of 10 quintals of natural product every 1-2 days which is being used to prepare nutritious vegetarian meals for all. The spokesperson while praising this monumental ruling, Dr. Rajwant Singh, originator and president of EcoSikh, [attached to United Nations Development Programme (UNDP) and the Alliance of Religions and Conservation (ARC)]. EcoSikh is a non-profit foundation, serving to boost knowledge about environmental matters and encouraging producers to concentrate on providing food by organic means, said that they are presently assuming that around 25,000-30,000 gurdwaras in Punjab will support the movement. “We need to respect the natural resources. Our creator gives the gifts,” he said. “Just think, if all the gurdwaras, temples and mosques switch to organic food in eating and sharing – the farmers will then see that there’s set demand, and they can start providing meals for which they will not have to use synthetic compounds and pesticides,” said Dr. Singh. “Everyone now is aware of how seriously chemically-grown diet influences their health and the conditions,” Dr. Singh told NDTV, adding that a definite message from the Offices of SGPC will surely be an incentive for all religions to encourage organic agriculture and take good care of our Motherland.